Scotlands first and only shepherds hut revivalists! The humble Shepherds Hut has undergone something of a revival in recent years, not least due to the current trends towards sustainable living, and the fact that the planning permission is often easier to obtain, where required, for a mobile space. Traditionally a Shepherds Hut would have been just that - a hut which the shepherd would trundle from field to field during the lambing season, and where he would sleep and get out of the weather. These days however they are more often designed and used as spare bedrooms, offices, summer houses or holiday rentals, and with all the facilities you would expect in your own home. Founded in 2010 after building a simple hut as a gift for a family member, The Original Highland Hut Company quickly became the go-to hut builders north of the border. Known for our spacious and well equipped living vans, ideal for permanent dwelling or holiday rentals, we are equally happy providing shepherds huts for personal and occassional use. 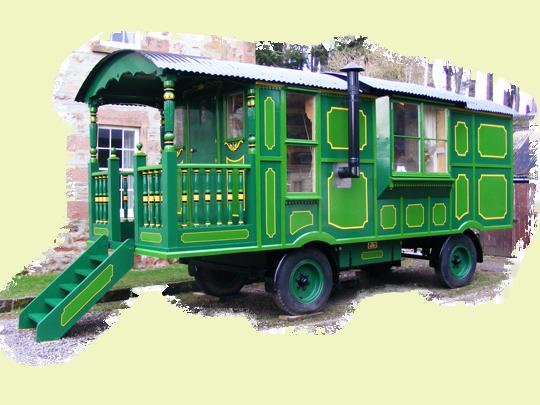 We have built wagons for customers as far afield as Tongue on the very north coast of Scotland, right down to Dartmoor in the south of England. We have even succesfully delivered one of our smaller huts to the roadless island of Rum. All of our wagons are bespoke, and are hand built by our small team here in the Scottish Highlands, so why not pop down and have a chat with one of our team, and see what we can build for you! Some of our previous builds are detailed in the slideshow below. The short 'walk around' video below focusses on the larger Showmans Living Van, and includes a look at the interior and the specification. Apologies for the occassional howling wind, but it was shot in January! This particular van has been sold, but we would be more than happy to discuss creating something similair for you.